Left: King Cake Right: I didn’t have 3 kings so I had to make do with 2 queens (I guess the statue of liberty is a queen) and a llama. Happy Epiphany! To celebrate the three kings locating baby Jesus (pre-GPS, a feat indeed) with their gifts of gold (score! ), frankincense (aromatic resin.. lame) and myrrh (more resin… gee thanks) we eat cakes with a hidden choking hazards. 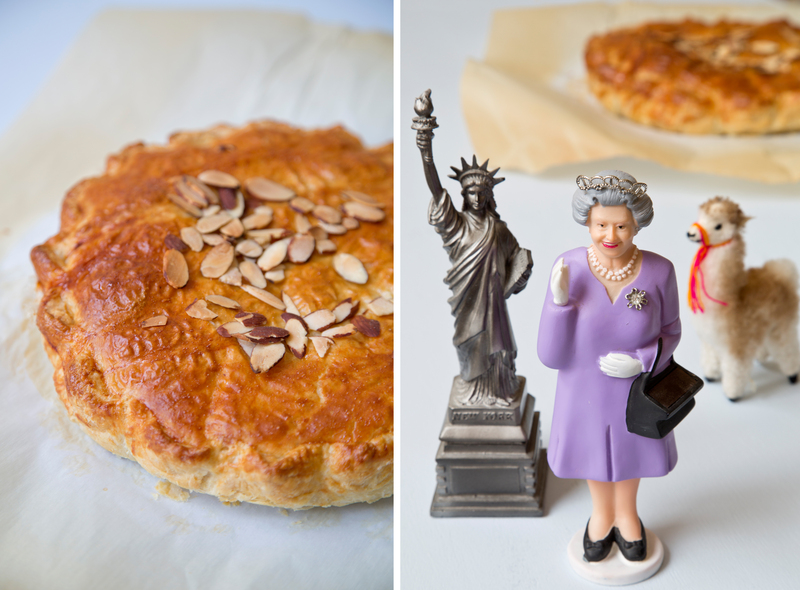 I wanted to photograph my galette with the three wise men, but I didn’t have three king figures, so I had to make do with 2 queens (and that is a loose interpretation of ‘queen’, since I don’t think the Statue of Liberty is technically a queen) and a llama. In the states we eat sugar and dye covered King Cakes with a hidden plastic baby. I’m not the biggest fan of the American version, but it is tradition. In France they make Galette des Rois, an almond infused cake with a hidden porcelain figurine that many people collect. I made the french version, complete with a porcelain fève, which literally translates to a fava bean. 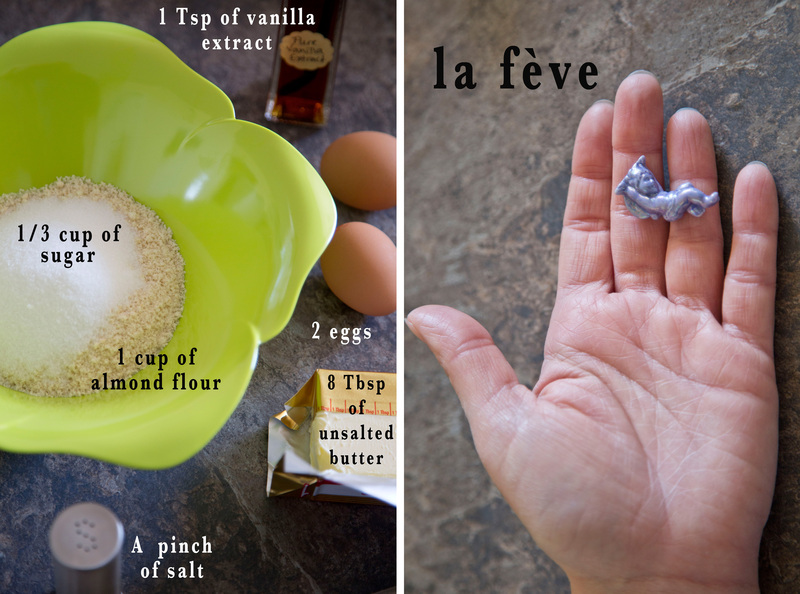 The ingredients of the filling of the king cake! Mix the dry ingredients together. Add 8 tablespoons of cut up butter and mix. Add two eggs and vanilla extract and mix thoroughly. Put in the refrigerator and chill for 30 minutes. 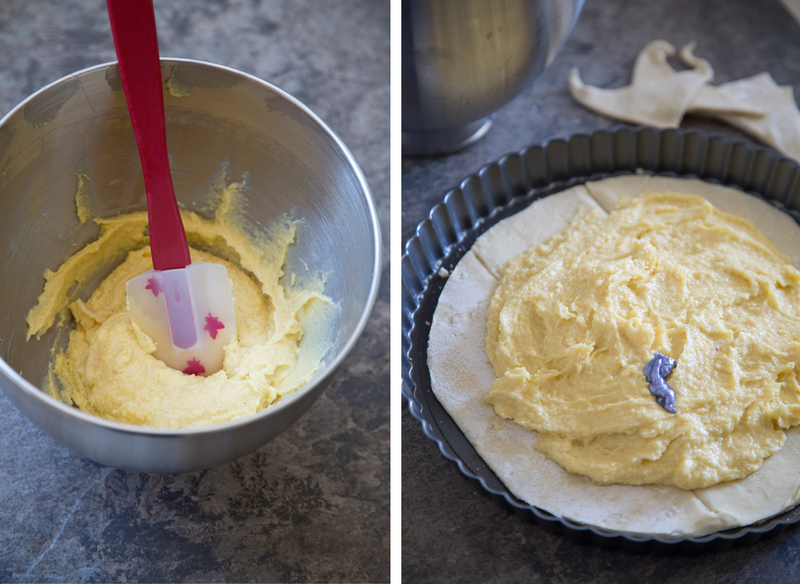 Take chilled puff pastry and cut into a circle. I wasn’t very precise, but I had a pasta bowl and used that as my template. Next add the almond filling to the crust and don’t forget to add your hidden baby jesus. Side note: Don’t forget to not choke on baby Jesus. That would be a tragic celebration of his birth. 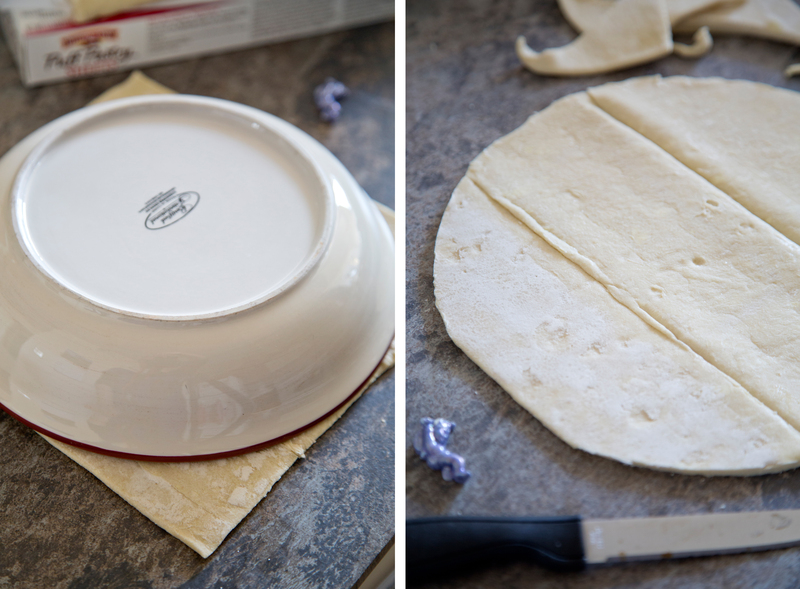 Pinch the crust together to create a seal and coat the top of the crust with egg whites. Sprinkle sliced almonds on the top. Bake at 400 degrees for 28 to 30 minutes. 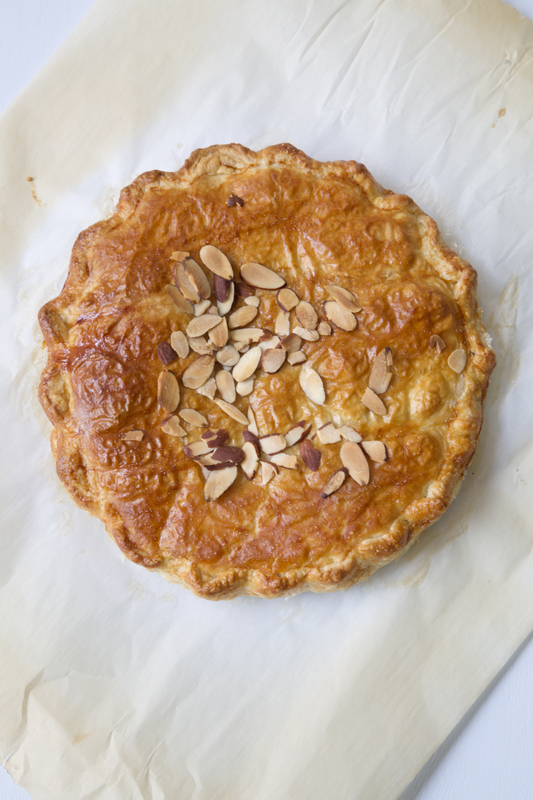 The mail carrier came to the door right when I was about to take my galette out and he’s a talker. I got distracted chatting about the weather so my cake is a bit overcooked. 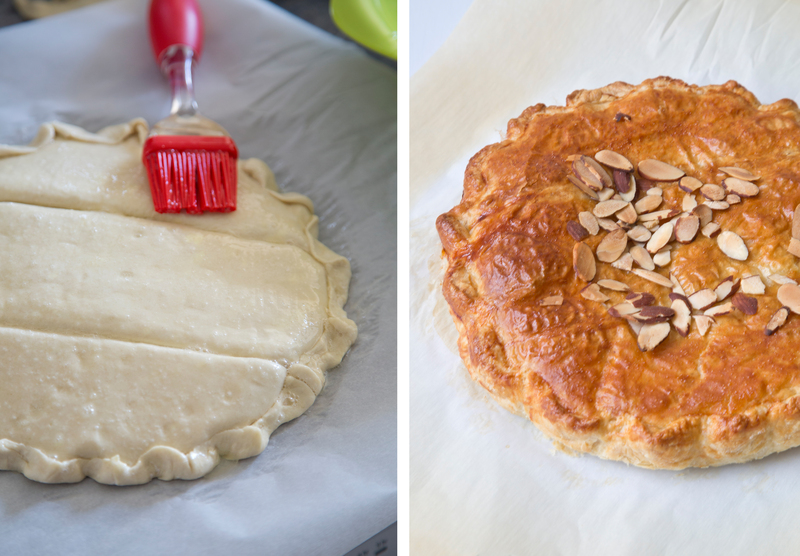 Categories: Recipe | Tags: almond, dessert, Epiphany, fève, galette des rois, holiday cooking, king cake, puff pastry, recipe | Permalink. Thank-you Sarah! Desperate times lead to desperate measures. Though I had many friends giving me a hard time for not including the queens corgis! Ha ha! It is strange how nicely the Queen and a llama work together! Maybe she should get won to go out in public with! Too funny. And you’re right: I love New Orleans, but the American version is just gross. I love New Orleans as well, but their king cake is too over the top. Their beignets are delicious though! Especially with Cafe Du Monde coffee. hmmm! I’m making myself hungry! This was the first time I made this and I have to say the frozen puff pastry did amazingly well with this recipe. I contemplated making the puff pastry from scratch, but I just saw an episode of “The Great British Bake Off” and they said it can be tricky to make so I got intimidated. If real chefs have trouble with it there is no hope for me. I got the fève as well! It was my first year to actually get it. My husband it usually always the lucky one. Hello, Thank-you! I’ll have to check out Nigella’s Cheats. I wanted to make it from scratch, but it seemed like a lot could go wrong, so I lost my nerve.